Thanks Brian, I’d like to think that 3D printing and the other additive manufacturing techniques of today will be the equivalent of what Wilkinson‘s boreing machine is to current machine tools. Early tools to bootstrap our way to those fabricators. I’ve made some progress on this build in a three steps forward 2 steps back kind of way. Before I get into the details let’s start getting the valves installed. 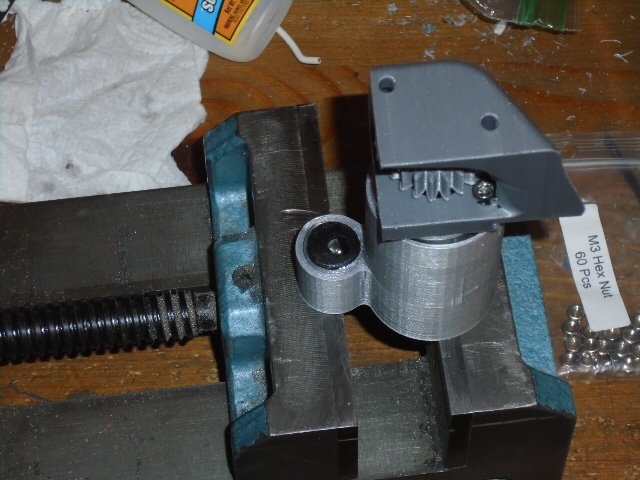 The first thing I did was tap the block for the set screws that retain the valve stems. 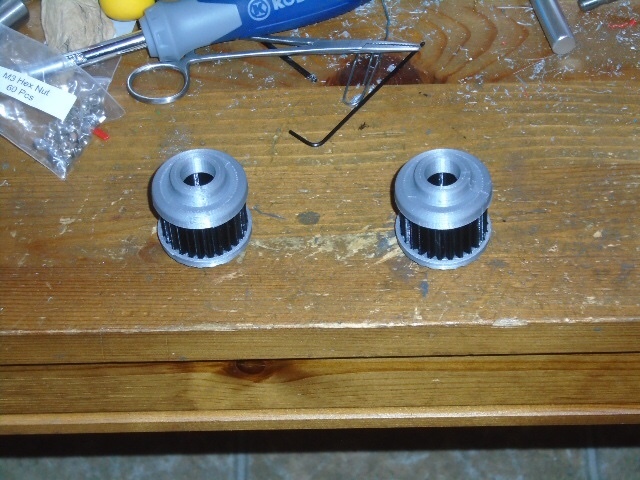 Next I assembled the valve lifters. First they were chucked into the lathe and cleaned up. Then they were threaded and a bolt screwed in. That’s when I ran into my first problem. 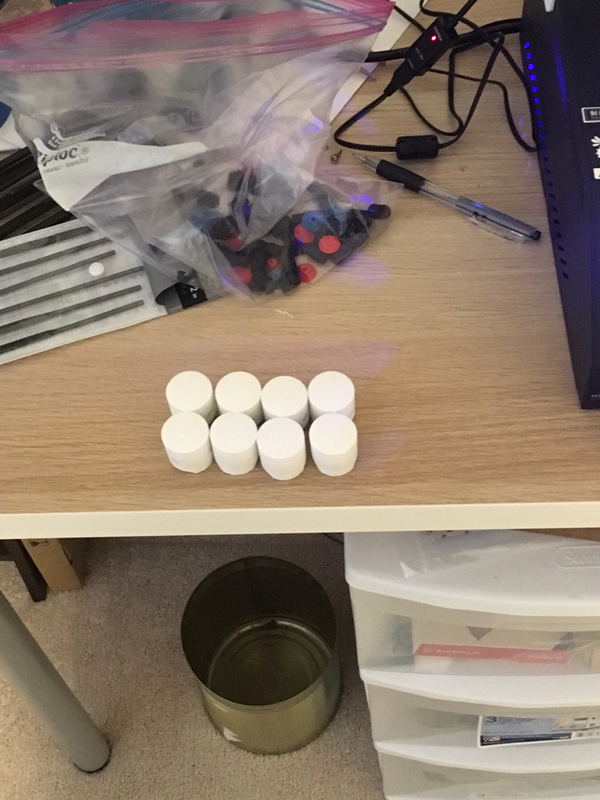 They didn’t fit in the block. The bores in the block were too uneven to install them. 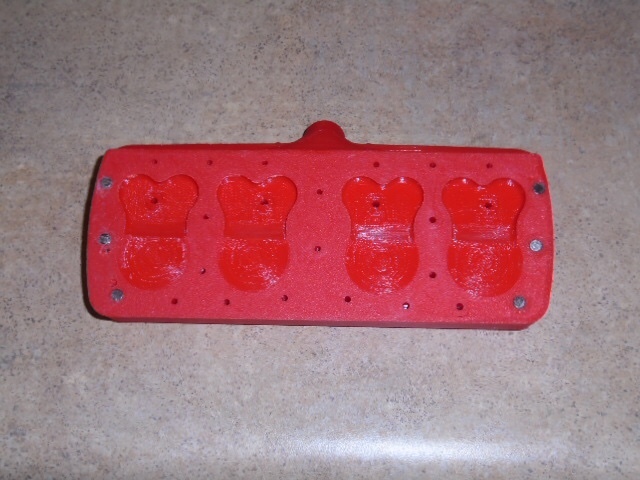 The holes needed to be reamed. 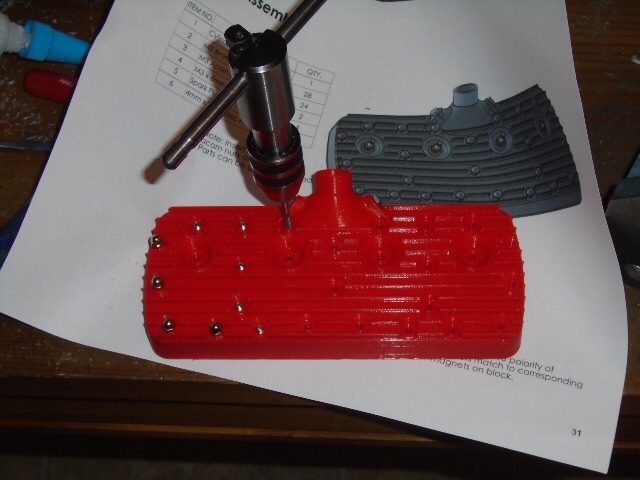 Since this model is designed for 3D printing, the block is metric and I needed a 10mm reamer. That was a good excuse to order a set of metric reamers. With the valve bores reamed I installed the lifters. (Sorry that picture didn’t come out). 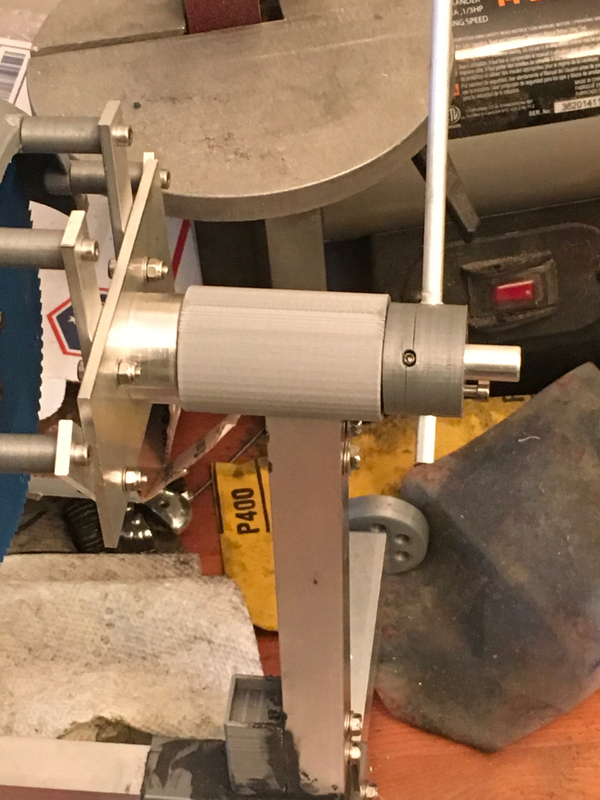 Next up was to assemble the valves themselves) the first thing to do was shorten the 16 screws that were going to be the valve stems. I turned and threaded a spacer of the correct length. Then I cut down the screws. 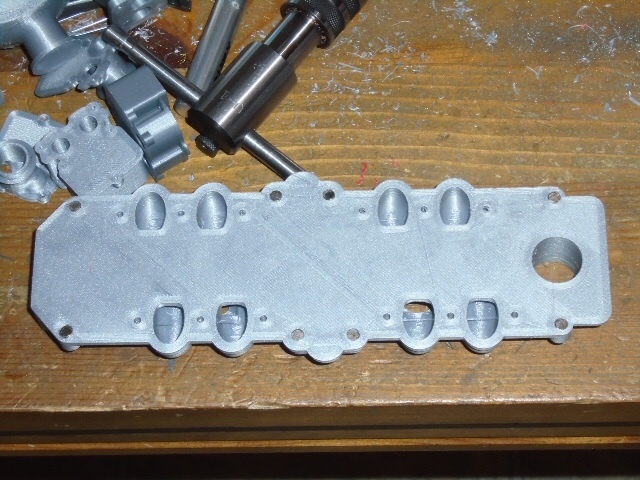 I assembled the 16 valve assemblies. 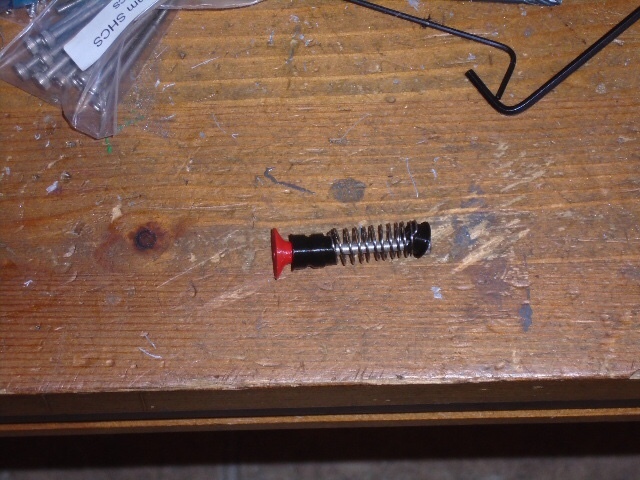 I ran into problems with the springs. They were too short and too wide and they had to be adjusted to fit. 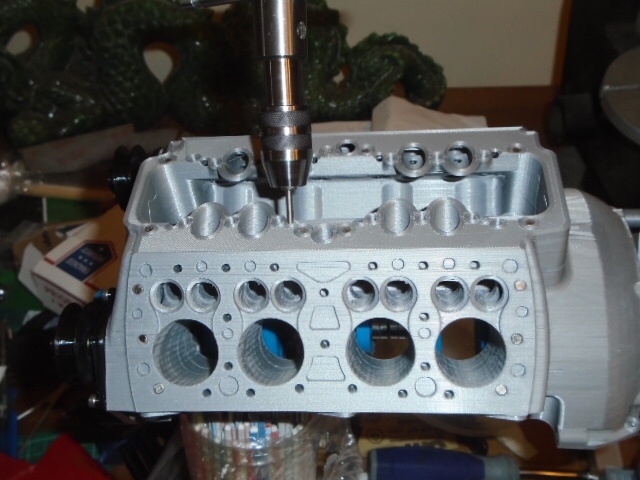 Putting in the valves has been the most fiddly part of this build. 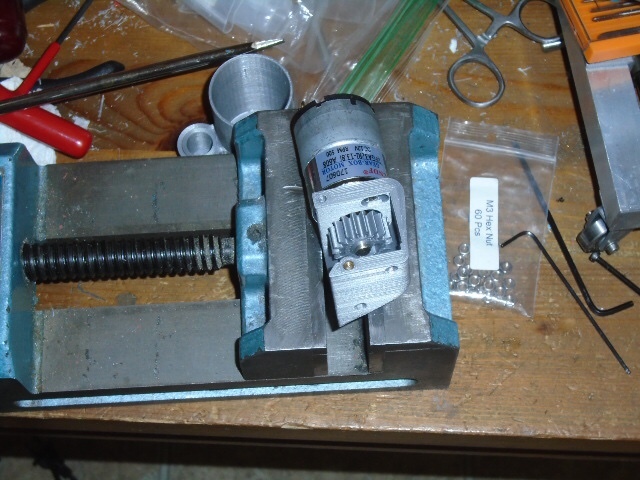 You have to insert them into the bore and press down the collar until the grove lines up with the set screw and then tighten the set screw down. 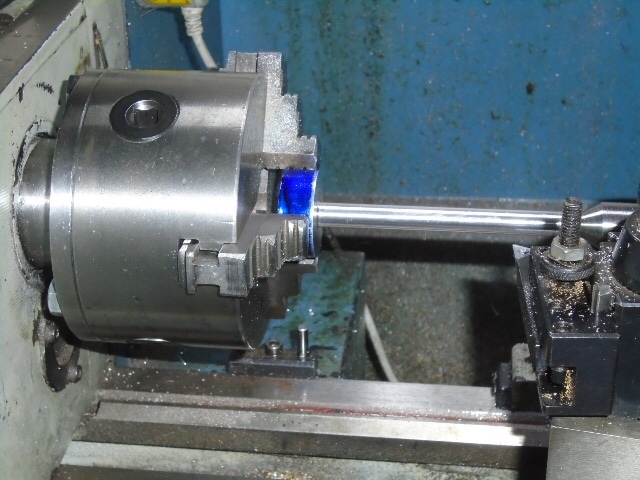 In practice it is easy to get the collar cocked at an angle in which case the valve will stick. If you push it in to far you end up interfering with the other valve and knocking it out of alignment. To make things even harder the engine kept sagging lower and lower on the stand. 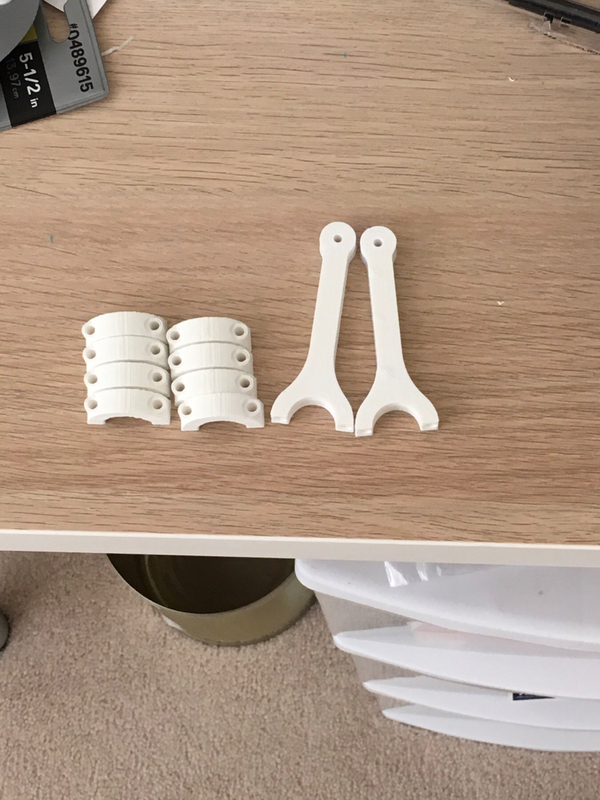 After some investigation, I found that the 3D printed parts don’t like to be in tension. I tried to fix the delimitation with some JB weld (I didn’t have any regular epoxy) and that was a mistake. 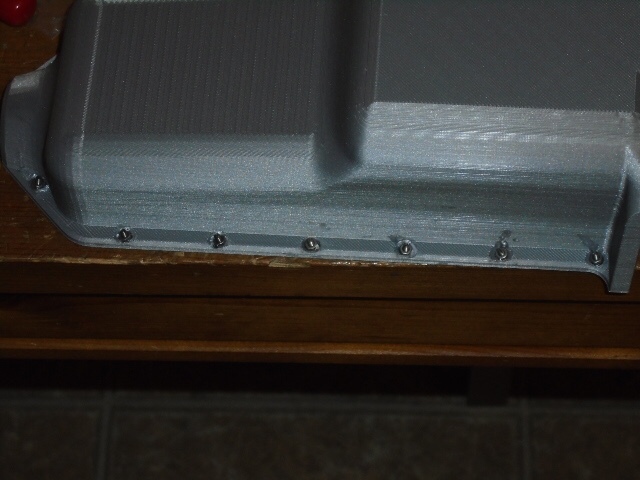 The outer layer just came loose from the infill. 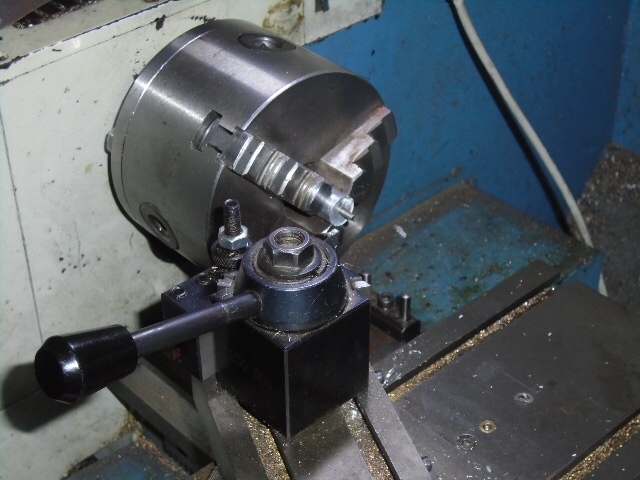 Thankfully I have a machine shop so I turned up a replacement part from aluminum. 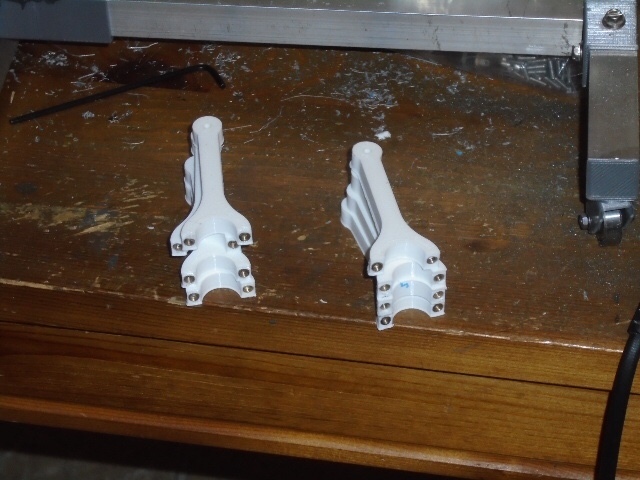 Here is the replacement part next to the failed part. You can see how the JB weld stuck the outer layer to the shaft and aided in the separation. 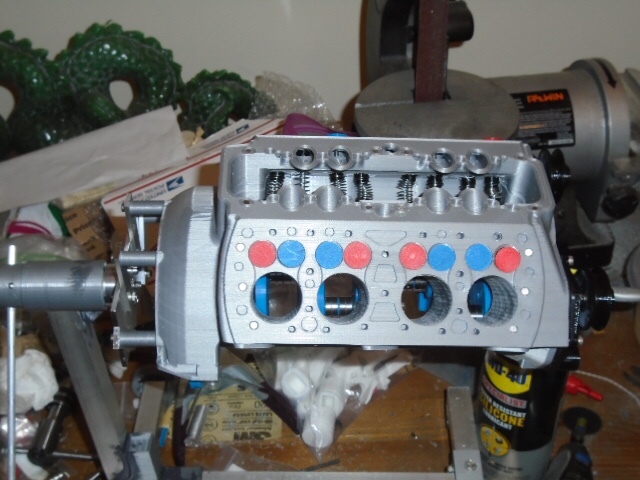 I’m going to end this update with a picture of the block with the new mount and the valves installed. It’s time for another update on this project. The next thing to be printed were the pistons and associated parts. 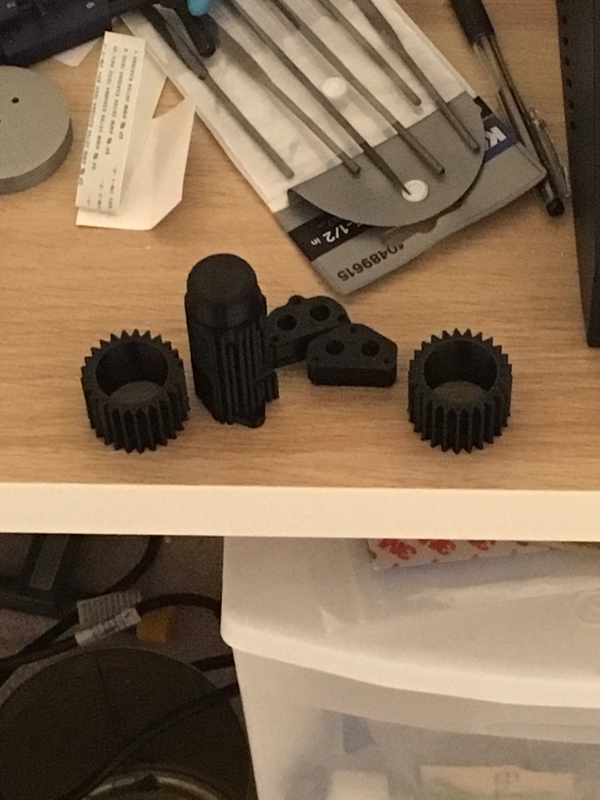 They were printed with my standard settings and there were no issues with the prints. On to assembly. 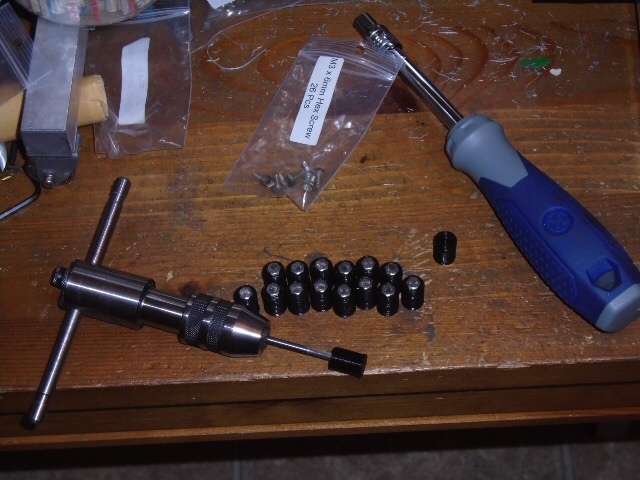 First I glued m3 threaded inserts into the connecting rods. Then the engine was inverted on the stand and the piston assemblies installed onto the crankshaft. While I was doing that I had another issue with the engine stand. As so often happens in the real world when you beef up one weak area you just move the stress concentration somewhere else. 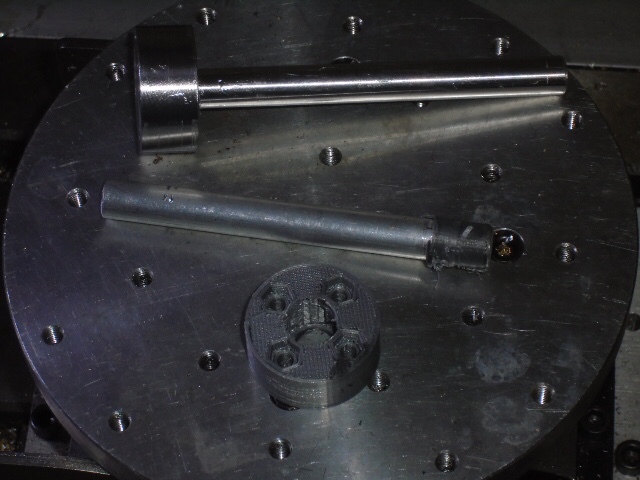 In this case the printed fitting that the shaft I made goes into couldn’t handle the growing weight of the engine and delaminated. 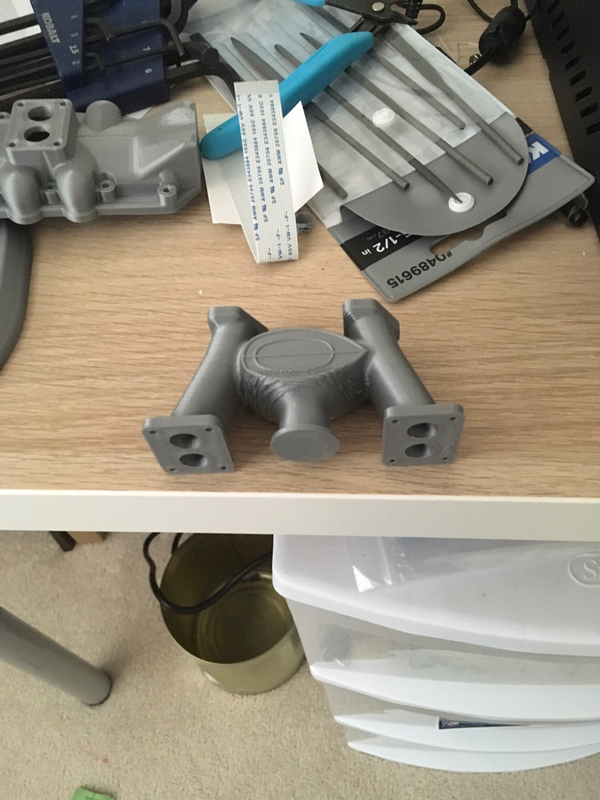 After looking at the damage I reprinted the part so the layers are running horizontally instead of vertical. That way the part isn’t under a shear load along the separation between layers. So far it’s holding. 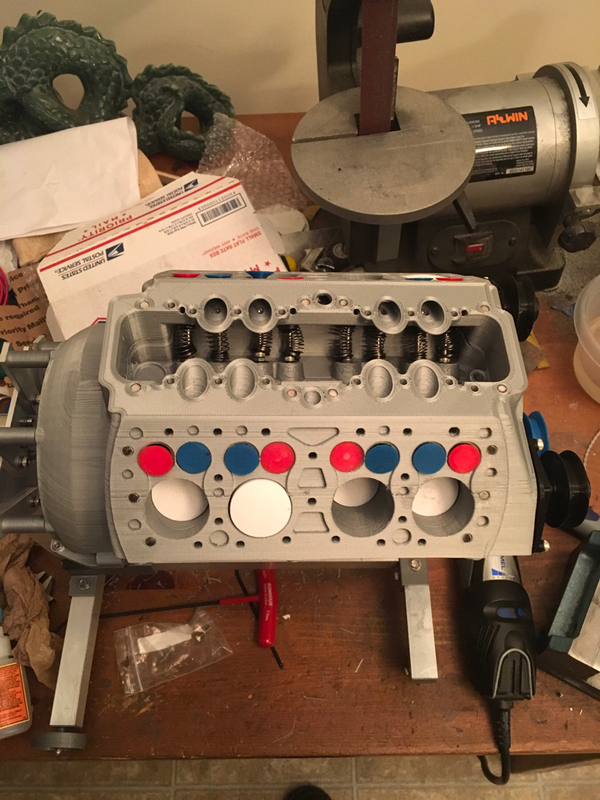 With pistons installed the engine looks like this. Next up was the heads. I printed the heads with a 25 percent infill and there was no issues with the prints. 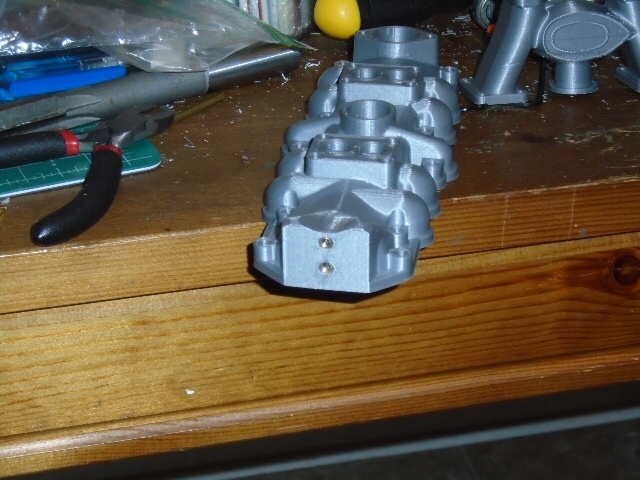 After printing, I glued magnets into the heads to hold them onto the engine. At this point I screwed up and accidentally installed some of the magnets backwards (polarity reversed) on one of the heads. As a result I had to scrap that head and make another. 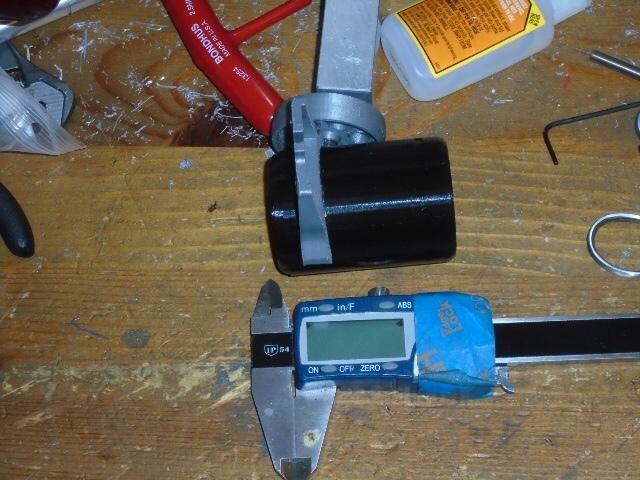 The one thing I’ve learned from this that next time I will align all of magnets to the same polarity to help prevent that from happening again. The next step was to tap all of the fastener holes M3 and install set (grub) screws into all of the holes. Then the acorn nuts and the spark plugs were screwed onto the set screws. 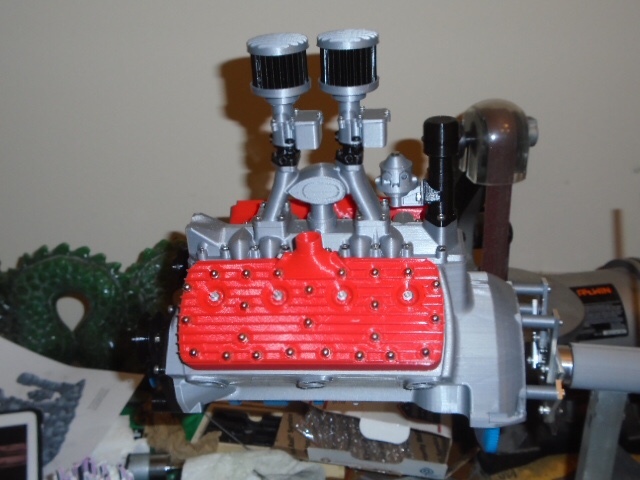 I’ll finish this update with a family shot of the engine with the heads installed. Very impressive Tony. Have you tried moving things around and round yet? I’m actually somewhat surprised. It turns quite freely with a little bit of silicon lubricant added. 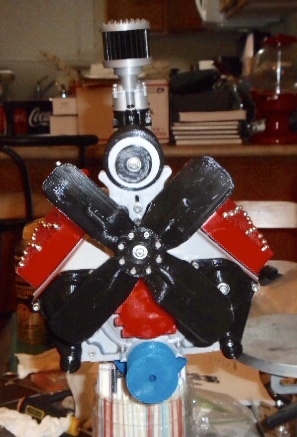 I am planning to do a video of it running once it’s done and the motor is attached. 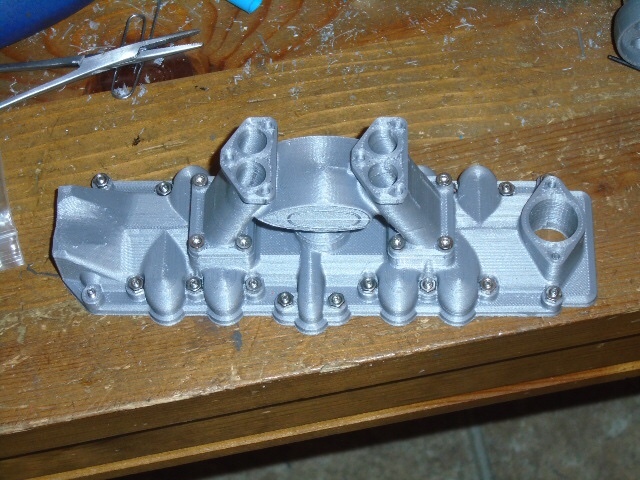 The next part of the build was to print the intake manifold parts. 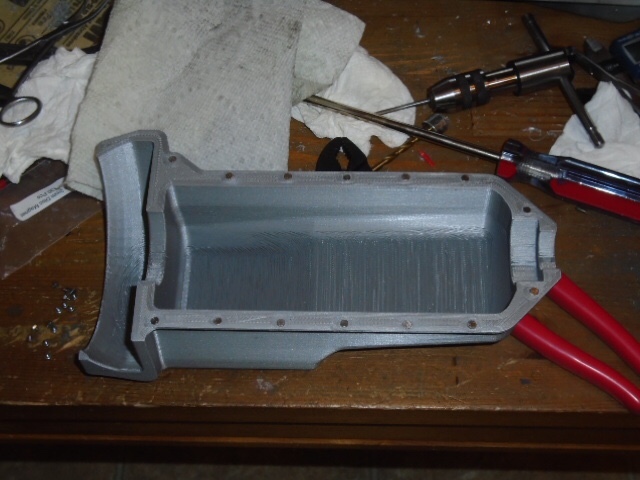 The main intake manifold was printed first with my normal settings and 25% infill. Next the riser was printed. I didn’t like the first one so I reprinted it with support and it came out better. 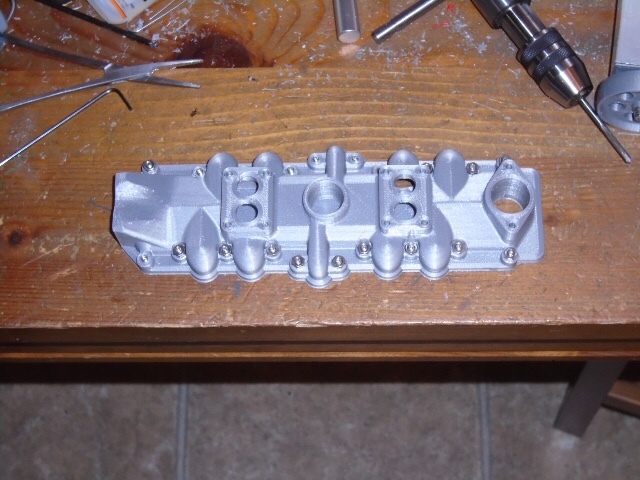 Then I printed the remainder of the small parts that go on the manifold. It was time to assemble the manifold. First the mating magnets were glued on. Then the inserts for the generator were glued in. Next, faux hardware consisting of a set screw and M3 nuts were glued onto the manifold. Then the riser was screwed on. 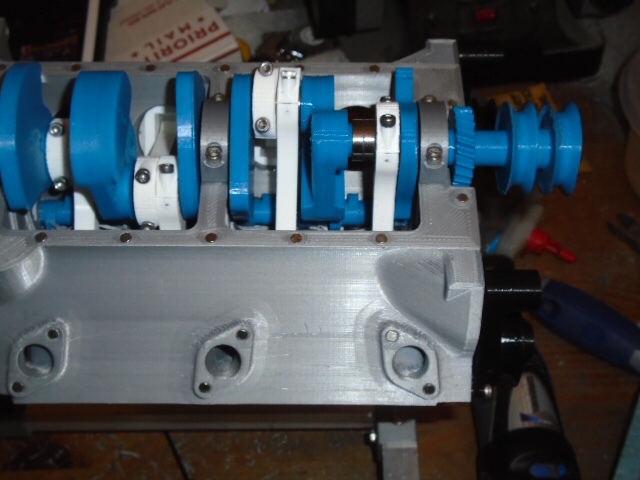 The breather tube and fuel pump were assembled and mounted to the intake manifold. 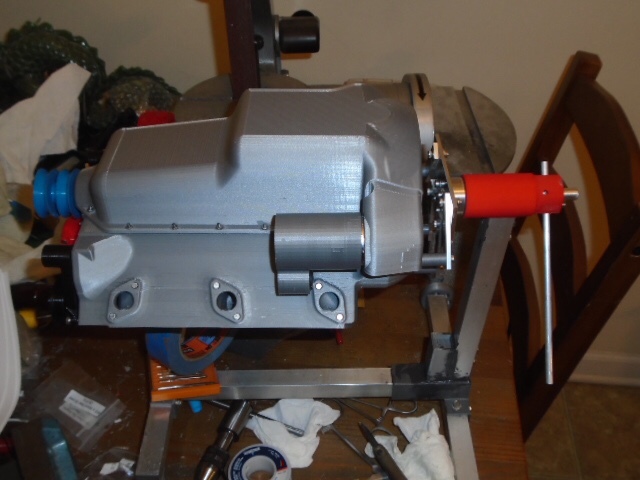 Then the carburetors and air intakes were assembled and mounted. 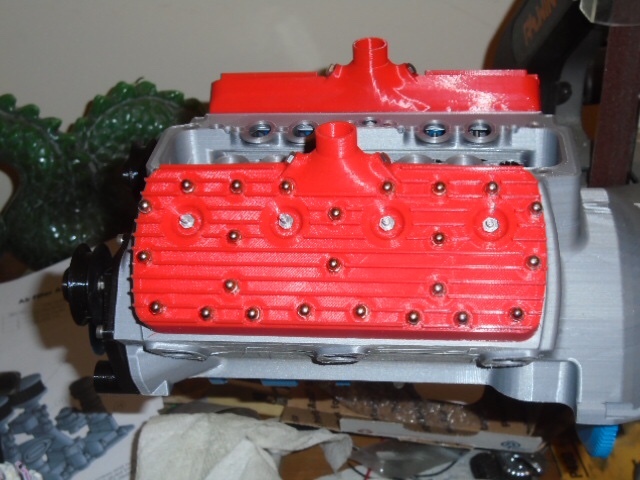 Here is a picture of the intake manifold mounted on the engine. 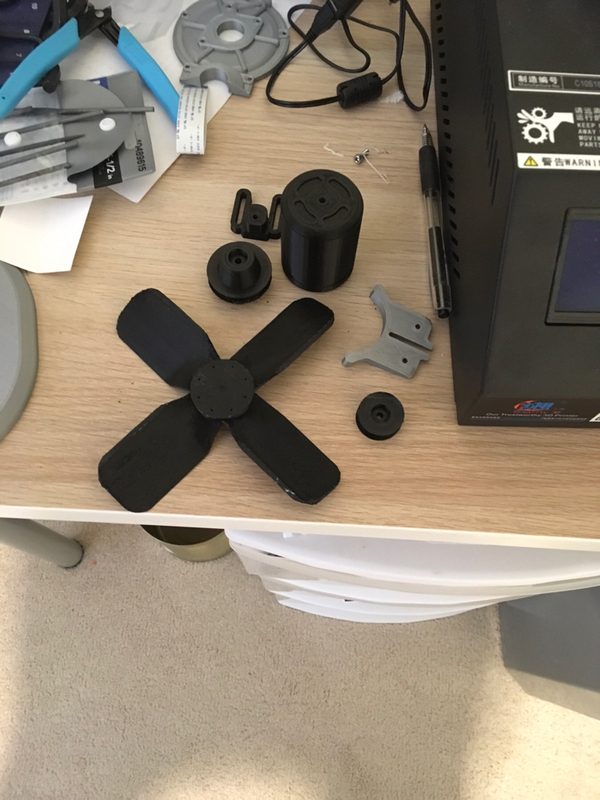 Next the generator and fan parts were printed with my standard settings at 25% infill. There were no issues with the prints. Inserts were glued into the generator mount and the mount glued to the generator. Then the rest of the generator was assembled. 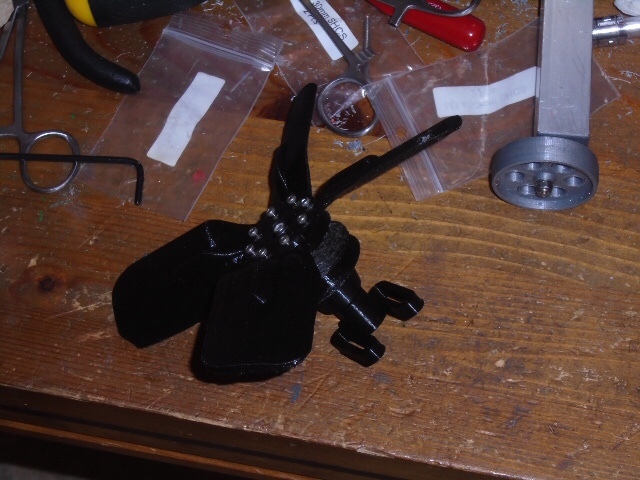 Next the fan assembly was built. 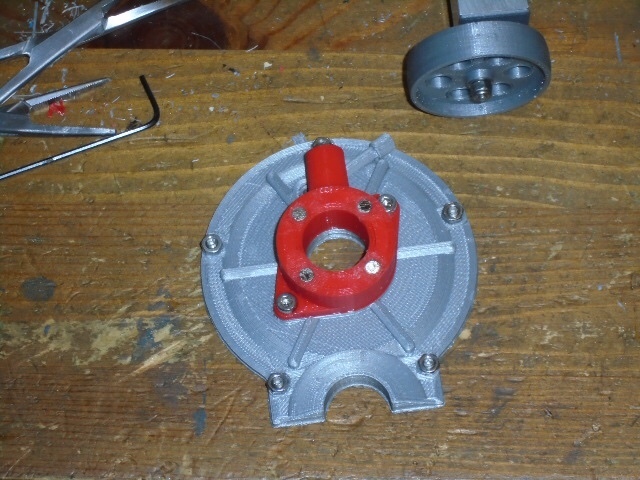 Those 2 assemblies were put to the side while I made the timing cover assembly. 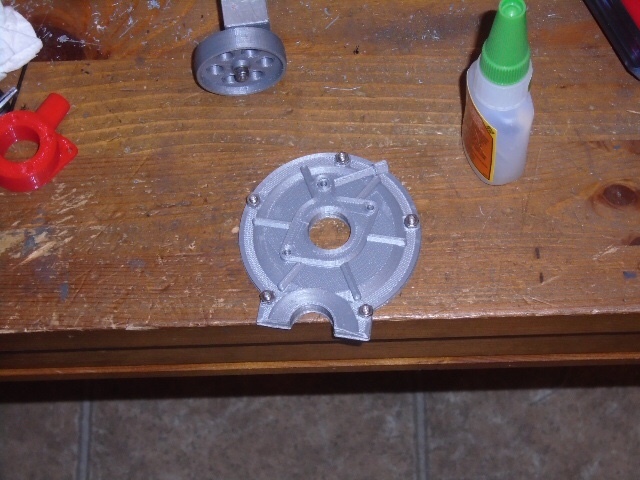 The parts were printed then the timing cover had it’s magnets and faux hardware installed. The distributor and cover had their magnets glued in and the distributor was mounted to the timing cover. The timing cover was installed onto the block and the generator and fan were installed onto the intake manifold. Here are two pictures showing the current state of the assembly. That’s it for now. Till next time. Some of the pictures were very dark so I post processed them to make them lighter. Along the way I think I screwed up the color balance. That may explain what your seeing. Ok let’s finish this one up. 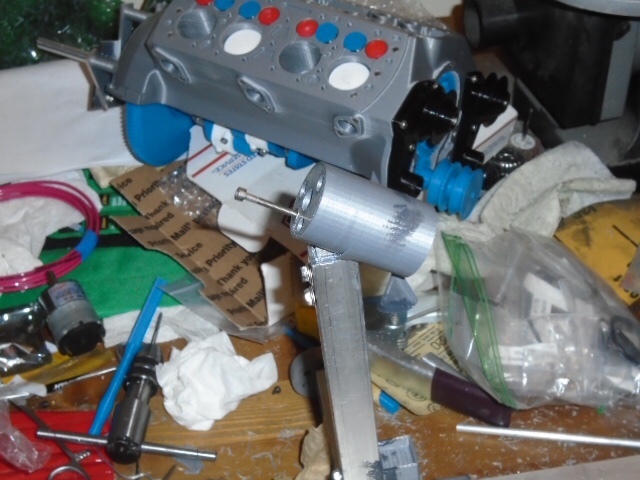 All I had left to do was the oil pan and the motor/electronics. 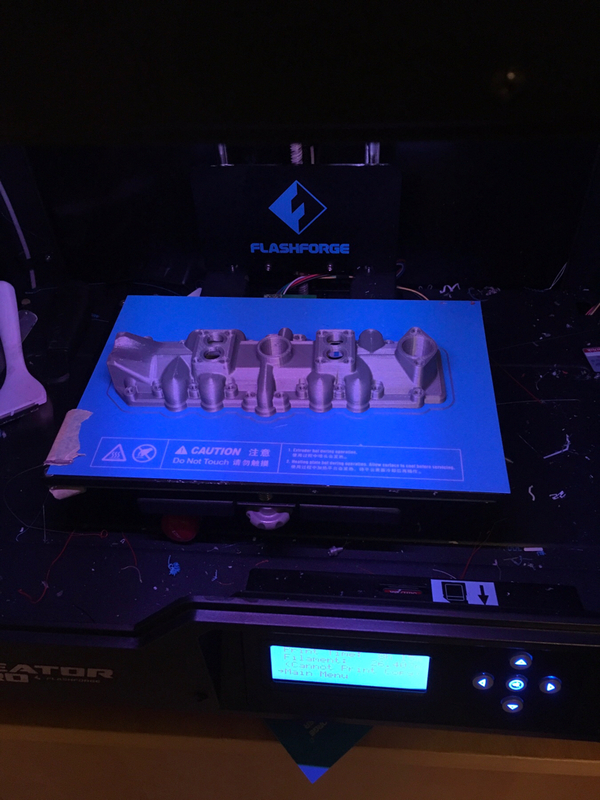 First I printed the oil pan and motor mount on my CR-10 using my standard settings. It was a four day print but it went well. First I glued in the magnets. Then I installed the faux hardware. With the oil pan done it was time for the motor and electronics. 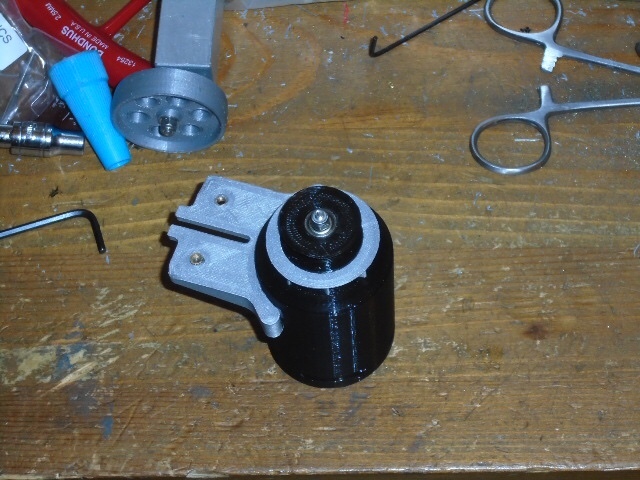 First I assembled the motor onto the mount with the gear. Then I soldered the leads onto the motor and the plug. Then glued it onto the motor. 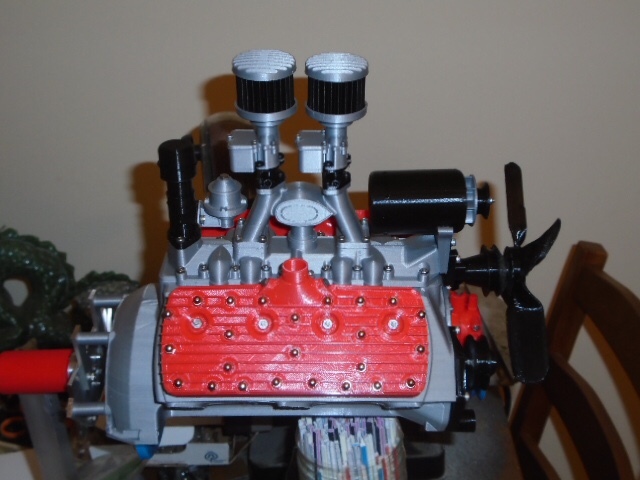 Here it is mounted on the engine. 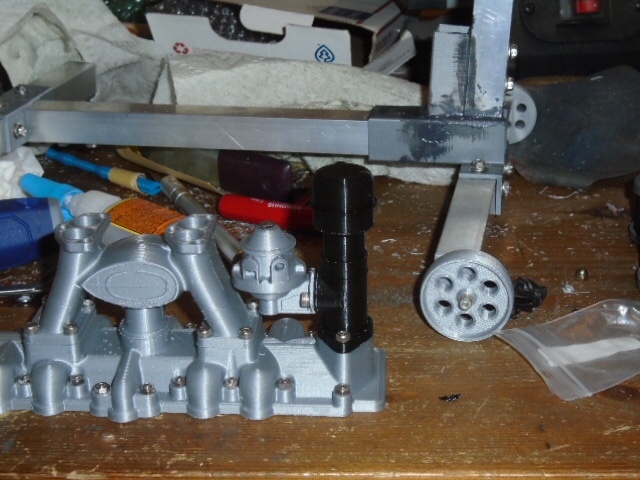 I installed the engine onto the final display mount with the motor speed control attached. That completes this model. I will do some final pics somewhere in the showcase. (I still need to figure out if this counts as an engine or a model). Wherever It ends up I will put the link here. Bad Behavior has blocked 15977 access attempts in the last 7 days. Page created in 0.422 seconds with 21 queries.